2010 Camaro Fuel Pump Voltage Booster [5A102-026] : Supercharger Superstore, Your Online Source for Vortech Superchargers, Paxton Superchargers, Procharger Superchargers, Magnacharger Superchargers and Techco Superchargers! For all you 5th Generation Camaro guys out there, making serious power with these cars means running into fuel supply issues. We have heard your cries for help, and are responding with our new programmable fuel pump voltage booster. 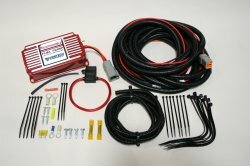 Ideal for vehicles making in excess of 500rwhp, this unit eliminates fuel pressure drop during high demand conditions, and will provide a stable 18-19 volt power supply to the OEM fuel pump. Removal of factory fuel pump or fuel tank is not required for installation, and control module mounts inside the trunk, in an out of the way location. Includes voltage control module, instruction sheet, and all necessary wiring. Installation time is 1-2 hours, and is compatible with most types/brands of aftermarket forced induction systems.